The Siberian Husky should never be shaved except in medical emergencies. There are vets and "professional" groomers out there who will tell you to shave your Husky. These people are uninformed about the breed. Dogs don’t sweat like humans. Their cooling process is done via panting from the mouth, sweating at the paws and cooling the blood in their ears. Shaving the dog does nothing to keep the dog cool. It just makes the human feel better when looking at the coated dog. Double-coated breeds such as huskies have a special undercoat. The undercoat hairs are short and crimped, and have a hollow core, which makes them highly efficient at trapping air and insulating the animal. The guard hairs on the top, which do not shed out, also provide protection against the sun’s rays and insulate the dog from the heat. Thus this double coat protects them from both cold AND heat. The Siberian Husky has little or no pigmentation in its skin. If you shave or clip a Husky, you expose it to the sun without protection. Now you have a dog that can suffer from a variety of skin problems, including allergies, sun burn, and skin cancer. Fur also acts as a protection against insects and parasites. If you remove that protection, the dog is exposed to even more insect problems than if he had been allowed to keep his natural, protective coat. The treatments for all these problems can then lead to more serious conditions. 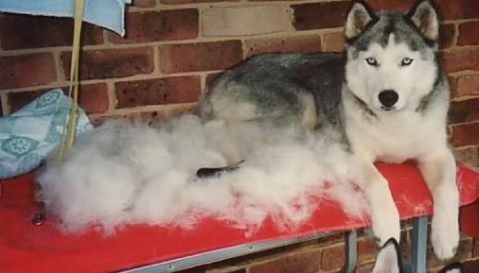 Furthermore, if you clip or shave a Husky it will eventually ruin the coat and disturb the proper shedding process. Even using a "de-shedding tool" (such as the Furminator), which actually cuts the fur, can damage the coat. The Husky top coat, also known as “color coat”, works as the reflective barrier; the under-coat insulates from heat and cold. Shaving the coat exposes the undercoat, and when the two coats grow they no longer “blend” properly to allow the maximum protection necessary or maintain the look for which the Husky is known.